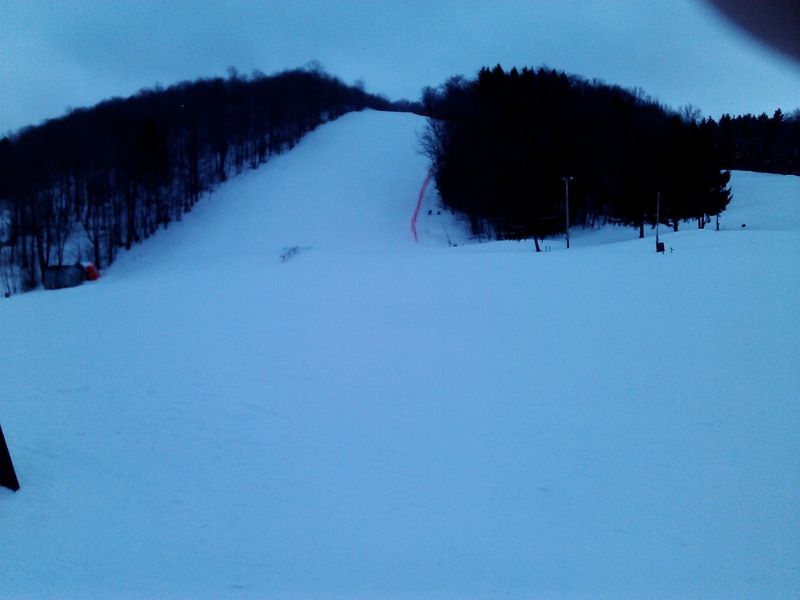 On my way home from a doctor's appointment in Syracuse I skied at Song Mountain. I arrived there about 1:00 PM expecting to see a reasonable number of skiers on the slopes. I think I was the only geezer there. However there were only a handful of other skiers as well. What a surprise to see the slopes so empty. I skied Song only one day this year when just the beginner chair and slope were open. Today, however, the whole mountain was covered with excellent snow and conditions were wonderful. It was fun to explore a whole host of trails new to me. From right to left facing the mountain the slopes range from greens and blues to some interesting black diamonds. Many of the slopes were partially groomed and some of the intermediate slopes had some soft moguls. There was about two to three inches of fresh snow to play with and some of the non-groomed areas had four to eight inches of eastern powder. The fat skies were the best choice for the day. In two hours of skiing I only repeated one slope once. Lots of fun to ski a different trail on each run. An Empty Slope - Mid-afternoon! It was a silent day since I never found another skier coming to the lift at the same time I was loading. The only social encounter was a brief conversation with a Fort Drum soldier as we both examined a trail map billboard. I don't enjoy skiing on crowded slopes. It is also weird to ski deserted slopes. It was a silent Song!